Fifteen years ago, a BMW X5 was one of the only luxury SUV’s on the market. Now, with more competition, the latest redesign has remained focused on the things people love about this crossover: the fact that it rides more like a luxury sedan than a truck, the added cargo space, and the extra features that keeps BMW a consistently popular choice for luxury vehicles. For those looking to haul around an entire family, this vehicle honestly may not be the optimal choice. The legroom is a little cramped for anyone riding in the second row, and especially cramped for those in the third row seats. However, this vehicle is a great choice for those who simply want an SUV with the perfect combination of style, luxury, and power. 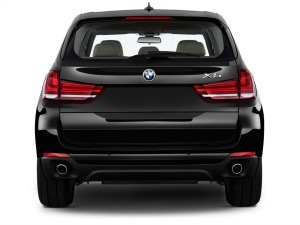 The 2015 BMW X5 comes in three basic trim levels: the 35i, the 35d, and the 50i. All three have all wheel drive, referred to as xDrive, and the 35i is available in an sDrive option that features rear-drive. The 35i and 35d both come standard with 18-inch wheels, automatic windshield wipers, mirrors that feature power-folding and automatic dimming, a panoramic sunroof, LED fog lights and adaptive xenon headlights, roof rails, a power-lift gate, and parking sensors on the front and rear. The interior features include premium vinyl upholstery, heated power front seats with four-way power lumbar, automatic climate control for dual zones, driver memory settings, and a power tilt and telescoping steering wheel. 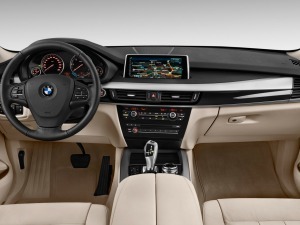 Standard electronic features include BMW Assist, a navigation system, voice controls, a 10.2-inch central display screen, Bluetooth phone and audio connectivity, the iDrive controller, traffic reporting, a nine-speaker sound system with a CD player, a USB/iPod interface with an auxiliary audio jack, and HD radio. Optional equipment packages offer further customization. Luxury, xLine and M Sport each have different wheel designs, trim, color schemes, and types of upholstery. Standalone packages can be added to any line. These include rearview camera and multi- contour seats, active steering, automated parking assist, soft-close automatic doors, upgraded leather upholstery, and upgraded interior trim. Other optional features include enhanced USB and Bluetooth plus smartphone app integration, rear window manual sunshades, second-row comfort seats, a third-row seat, a 16-speaker Harman Kardon surround-sound audio system, a rear-seat entertainment system, and a night-vision camera. With a starting base price of $53,200, all the extras and addons can push the total price above $70,000. All 2015 BMW X5’s have eight-speed automatic transmissions. The xDrive versions also feature hill descent control. Both the sDrive35i and xDrive35i models have a 3.0-liter turbocharged inline six-cylinder engine that have 300 horsepower. sDrive35i and xDrive35i can go from zero to 60 miles per hour in 6.2 seconds, according to BMW, which puts these two models in the top of their class. The xDrive35d’s performance is comparable at 0 to 60 mph in 6.7 seconds. BMW puts the xDrive50i capability at a swift 4.9 seconds. The xDrive 35d gets good gas mileage: an average of 27 mpg according to the EPA. The sDrive35i has a decent fuel economy averaging 22 mpg. The xDrive version gets 21 mpg. The xDrive50i has the lowest fuel economy at only 17 mpg combined. xDrive50i has a turbocharged 4.4-liter V8 engine with 445 horsepower. The xDrive35d features a diesel-powered 3.0-liter turbocharged inline-6 that produces 255 horsepower. 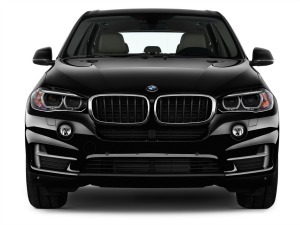 All 2015 BMW X5’s include the following basic safety features: stability and traction control, anti-lock brakes, automatic brake drying, front side airbags, side curtain airbags, active head restraints, BMW Assist and Remote Services emergency communications systems which provide automatic crash notification, stolen vehicle recovery, remote lock/unlock, and on-demand roadside assistance. There is also an optional Driver Assistance package that adds a rearview camera and a head-up display. The Driver Assistance Plus package also adds blind-spot monitoring, a top-down camera system, lane-departure warning, forward collision warning, speed limit info, and a collision mitigation system that can apply the vehicle’s brakes automatically to prevent collision or minimize head-on impact at low speeds. In Insurance Institute for Highway Safety testing, the optional collision mitigation system earned the top “Superior” rating. The BMW X5 itself earned scores of “Good” for performance in the moderate-overlap frontal-offset impact tests and the side-impact tests. 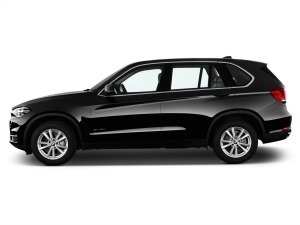 The BMW x5 has an elegant interior layout based on solid construction and quality materials. Upgraded leather options are one of its best features. Classic BMW gauges along with a large central display screen that features crisp graphics make it clear that this is a vehicle designed with style and functionality in mind. The standard adjustable front seats are perfectly shaped for a wide range of body types. The optional multi-contour seats are among the most comfortable and adjustable seats around. The iDrive interface works well for controlling and adjusting all of the vehicle’s systems. It conveniently includes a touchpad on the control knob for handwritten navigation inputs. Still, the iDrive requires a little more effort than other systems made by its competitors that outrank it in ease of use. While the design of the front seats are near perfect, the second row seat could use a little more legroom. The optional third row seat is just too small, even for children. 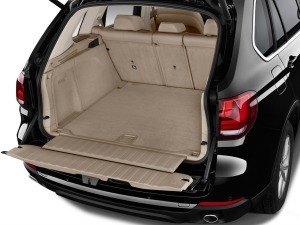 Cargo space measures 66 cubic feet, making cargo adequate, but no better than average for similar vehicles. 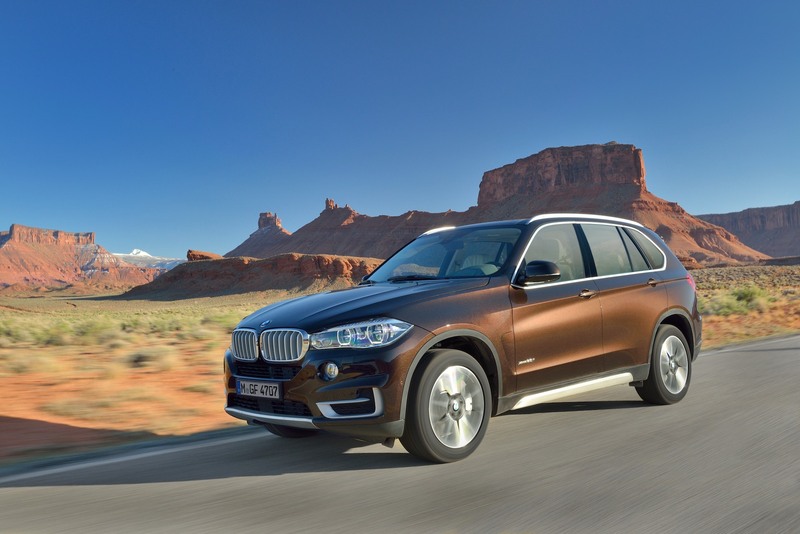 The 2015 BMW X5 handles extremely well for a midsize luxury crossover. It feels secure and stable, while also being pleasant to drive. The vehicle itself drives quietly, and road and wind noise are almost inaudible. However, for those riding in the backseat, the ride may feel a little cramped. Engine performance is strong, even with the basic six-cylinder engine. The turbocharged V8 engine gets spectacular acceleration. The 35d’s diesel six-cylinder has great torque output that provides quick acceleration without sacrificing strength. The above average fuel economy added in makes this vehicle a winner.